In our house we have some fairly strict dietary restrictions for the Monkey and for myself. When I was a child my parents would usually buy me a small present for Easter as I was allergic to dairy and could not eat chocolate. Toys were great but I felt a little left out from the other kids who had easter egg hunts and got lots of yummy chocolates. Obviously I know now that the toy was definitely better then all that chocolate but as a child you really don’t want to ever feel different. For the Monkey this means I make his easter chocolate every year which allows me to make them with better ingredients and void of things we can not eat. 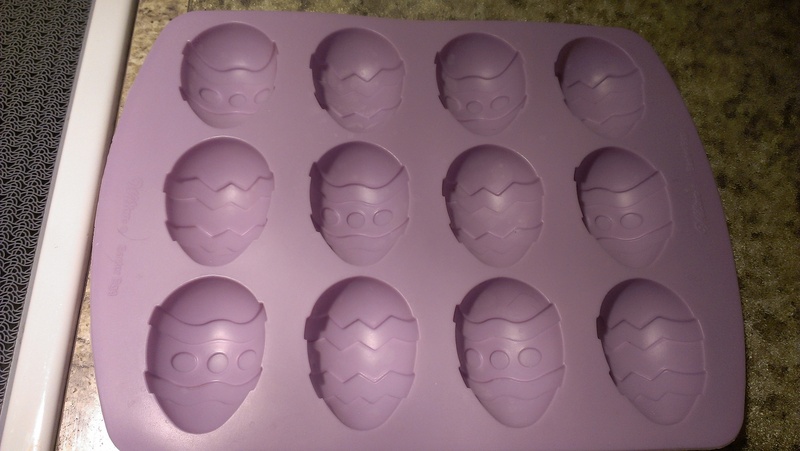 Last year I bought this awesome silicone easter egg mold from our local bulk barn.You can make solid chocolate eggs with it or filled eggs like the recipes I am sharing today. 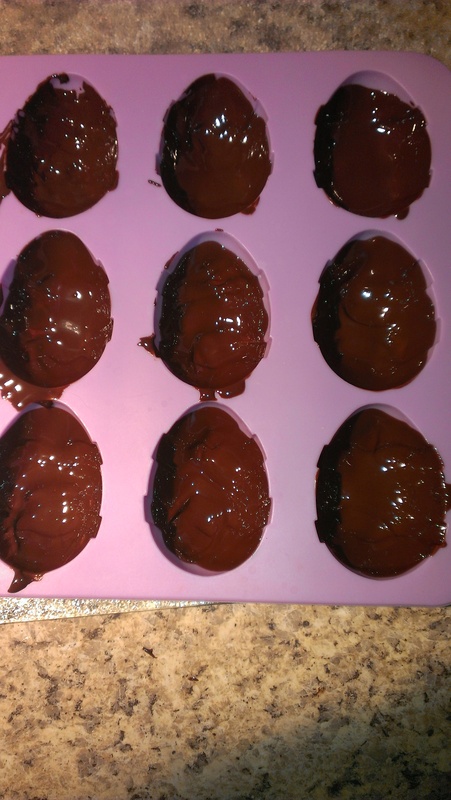 Each recipe yields 10 medium sized eggs so if you find a smaller mold or if you decide to use mini muffin cups your going to get much more or you can choose to cut the recipe in half and make fewer chocolates. Usually I would make one kind of filled and a few solids but this year because I wanted to take pictures of the steps to share with you I made each kind. Lets start with peanut butter. This can easily be substituted for almond butter as well but I have found seed butters are to dry to be used here. Peanut butter are the Monkey’s favorite kind and I have made them on other occasions throughout the year. Start by melting the chocolate over a double broiler. I used a pot filled with water and a metal mixing bowl placed on top. 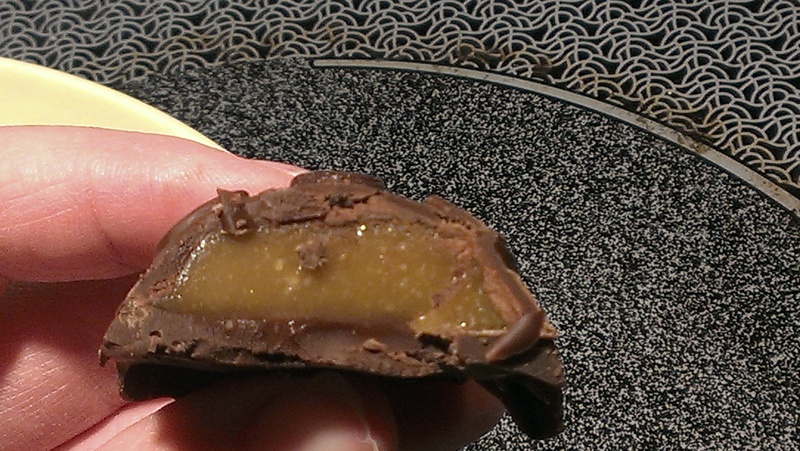 Once chocolate is melted pour a bit into your mold and spread it up the sides. Place prepared molds on a baking sheet and allow to set in the freezer while you make the filling. Next, in a medium sized metal mixing bowl that fits over your pot of boiling water measure out your peanut butter, honey, and salt (coconut oil as well if you are using it). Place bowl over the pot and mix everything together until well combined.This helps to soften and melt the peanut butter and oil if using so that everything is mixed well. Add the rice cereal if using and stir. 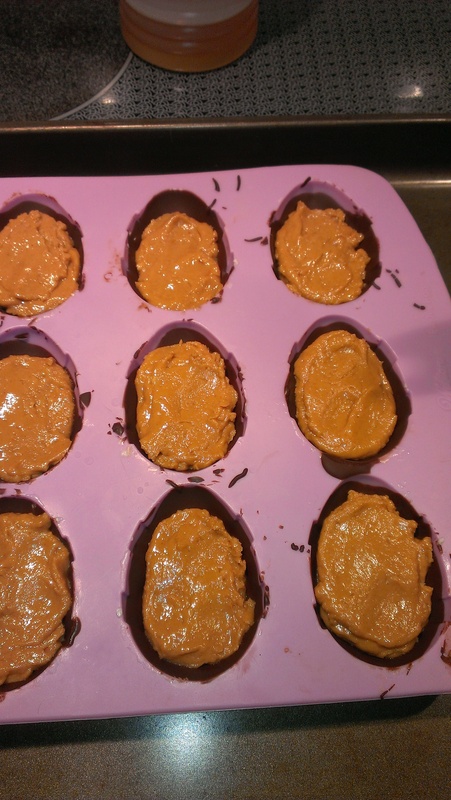 Remove prepared molds from the freezer and fill with the peanut butter mixture. 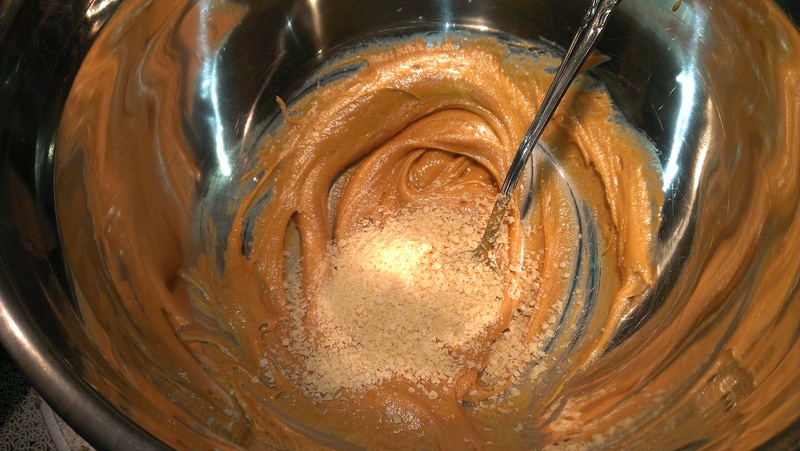 flatten the peanut butter out as evenly as you can in each mold and then cover with some of the melted chocolate. Note that you may need to remelt you chocolate a bit over the pot of hot water if the chocolate has started to thicken. Spread chocolate out evenly so no peanut butter is visible. Place back in the freezer till the top sets about 10 minutes. Carefully remove from molds and place into a bag or container until needed. Next, in a medium sized metal mixing bowl that fits over your pot of boiling water measure out your coconut butter, honey, coconut oil and coconut extract. Place bowl over the pot and mix everything together until well combined.This helps to soften and melt the coconut butter and oil if using so that everything is mixed well. Add the shredded coconut and stir. 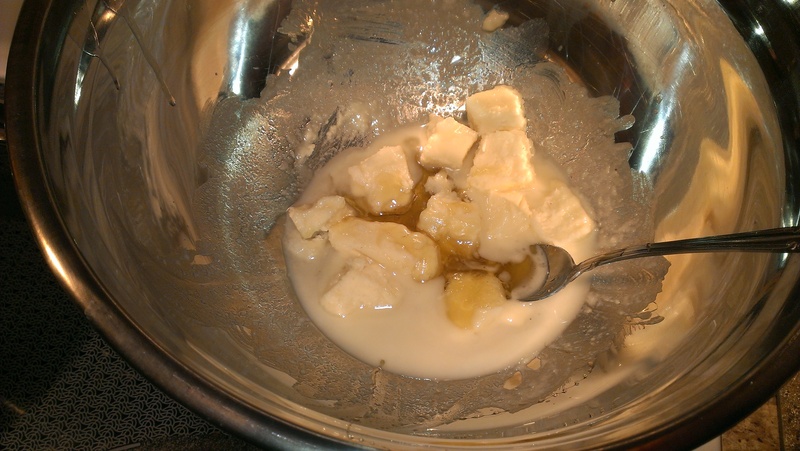 Remove prepared molds from the freezer and fill with the coconut butter mixture. 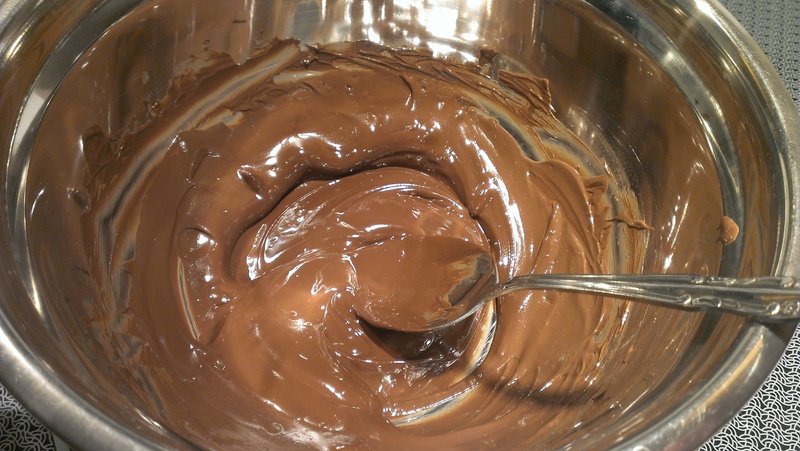 Flatten the coconut butter out as evenly as you can in each mold and then cover with some of the melted chocolate. Note that you may need to remelt you chocolate a bit over the pot of hot water if the chocolate has started to thicken. Spread chocolate out evenly so no coconut butter is visible. Place back in the freezer till the top sets about 10 minutes. Carefully remove from molds and place into a bag or container until needed. In a small saucepan measure out all ingredients. Place on a burner on medium heat, on my electric range this was 5. Stirring continuously allow the butter and sun butter to melt into the honey. This takes about 3 minutes. Once the mixture is melted and combined turn the heat up to medium high and allow the mixture to just come to a boil. Keep stirring to make sure the mixture does not burn. After about 5 minutes remove from heat. 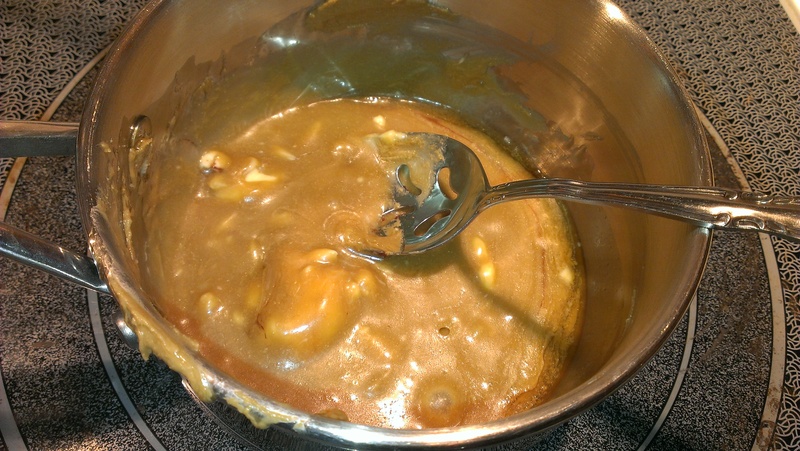 Mixture will be EXTREMELY HOT so be careful and although it will look runny when it cools it turns into a delicious caramel filling. 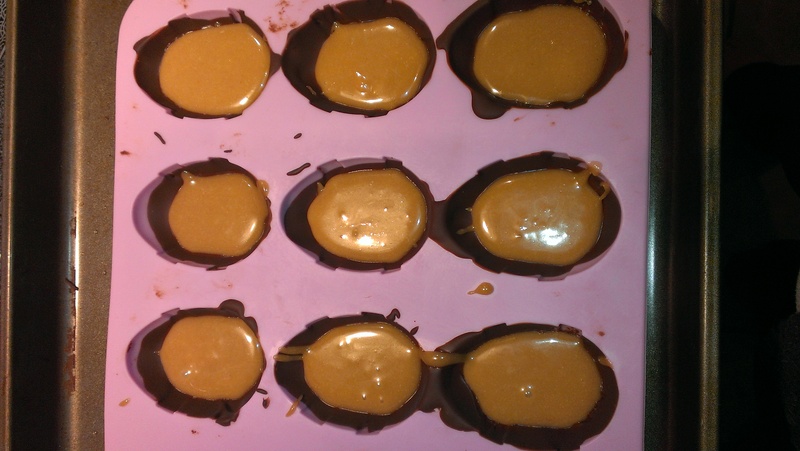 Remove prepared molds from the freezer and fill with the caramel. Cover with some of the melted chocolate. Note that you may need to remelt you chocolate a bit over the pot of hot water if the chocolate has started to thicken. Spread chocolate out evenly so no caramel is visible. Place back in the freezer till the top sets about 15 minutes. Carefully remove from molds and place into a bag or container until needed. Once they are all set here are the finished eggs. 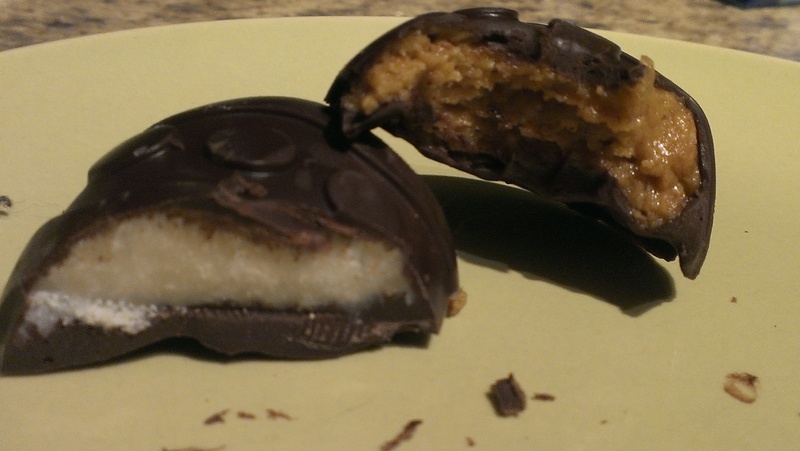 Here are the coconut and peanut butter ones cut open. 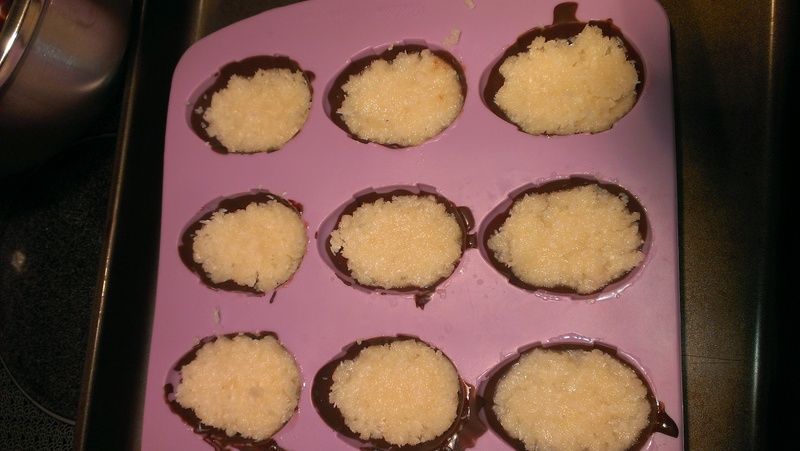 The coconut eggs remind me of a Bounty Bar. I also realize I need to start using my actual camera when taking pictures rather then my phone. Sorry for the blurriness! Here is the caramel. I love the nutty flavour that they sunflower seed butter adds to this caramel filling. Thanks for sharing these recipes. One idea for an Easter egg hunt is what we are doing for the first time this year – we will hunt for plastic eggs in the garden that have tiny treasures inside them! We have kept these egg shapes from buying Cars and Thomas the Tank engine treats all year round. My son loves to collect items in groups-like marbles, animal figurines or even stickers. So we will stuff these tiny treasures into the plastic shells and have an Easter Egg hunt with granny on Sunday. Here’s wishing everyone peace, love and laughter this Easter! That’s a great idea! I’ll need to remember that for next year. Because we have dogs and cats I write out clues in platic eggs which I hide around the house. Each clue leads to a bag with a chocolate inside.